Whether you like it or not, Christmas would not be complete without ending your feast by serving the traditional Christmas Pud, crowned with holly and brought to the table in a wreath of blue flames. But the origins of Christmas pudding are nothing like the sweet plum pudding we know today. Christmas pudding was originally; known as ‘hakin’ because of the huge amount of ingredients it contained and then was later known as ‘Mince Pie’. The earliest recipes known, date from the Middle Ages and name rabbit, poultry, pheasant and partridge amongst its contents. During the Middle Ages, an alternative version of the dish developed called ‘Frumenty’ which was a rather soup-like Christmas porridge consumed during the fasting period of Advent. It was made by boiling corn or wheat with mutton and beef in milk and unlikely as it seems, it was this gruel-like substance which formed the basis of what we now eat. By the 14th century, as trading routes opened and people gained access to citrus fruits and exotic spices from abroad, these were added to the mix. The meat was also sweetened using sugar, apples, raisins, prunes and wine. Then, by the year 1595, eggs were added, along with dried fruit and breadcrumbs and flavoursome spirits, so thickening and flavouring the mixture. Thus emerged ‘plum pudding’. The enjoyment of plum pudding, however, didn’t last long The Puritans, outraged by such a show of immoral gluttony during Advent, banned it in 1664. Its richness was described as being “unfit for God-fearing people” and the custom was described as ‘lewd’. Nevertheless, plum pudding made a spectacular come-back with George I in 1714 when, despite objections from Quakers, he re-introduced the dish as part of the Christmas festivities. It was at this point, meat was left out and it became a solely sweet pudding. It was also around this time, that the tradition began of using brandy to set the pudding alight. Traditionally, the Christmas pudding is prepared on the 25th Sunday after Trinity – or about five weeks before Christmas. This day has now become known as ‘Stir-up Sunday’, for tradition dictates that every member of the household takes a turn in stirring the pudding mixture. These days, children are encouraged to make a wish, but originally, the stirring went from east to west and was supposed to represent the three Wise Men, whilst the 13 ingredients represented Christ and the twelve apostles. The holly placed on top of the pudding signifies the crown of thorns on Jesus’ head (also bringing luck and healing properties) and the flames are said to remind us of His passion. There are many traditions associated with Christmas pudding, some of which we still like to maintain to this day. Often little charms such as silver coins, thimbles, or rings were hidden in the pudding – as well as other objects such as small wishbones for good luck or an anchor wishing for safety at sea. People still like to add a coin today with the finder receiving wealth, health and happiness for the New Year to come! So if you haven’t made or bought yours already, save a thought as you do, for the rich heritage of the humble Christmas pud – and stick a coin in as you do! 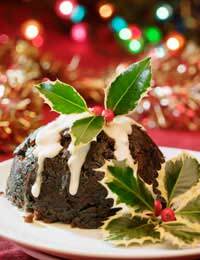 Here is a great recipe if you'd like to make your own Christmas pudding.